Please Let the Shooter Be on the Other Guy’s Team! We can't help but think that—but only one team gets top-notch fear mileage. At that early point, Leon Wolf of the conservative Redstate.com was on the lookout for liberals like me jumping to conclusions—as I was on the lookout for wingers who assumed it was Muslim terrorism. 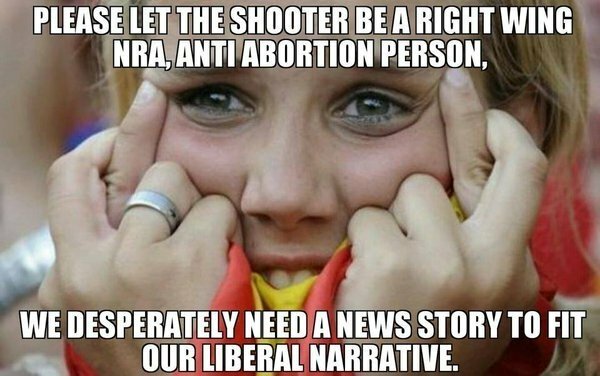 Wolf trolled “breaking: Mass Shooting in San Bernardino, Liberals on Twitter Ecstatic,” and he ran “some tweets from liberals who are involved in their favorite sporting event, pin the shooting on a conservative!” To say anyone was “ecstatic” is disgusting, but this meme then making the rounds did speak to me. At the same time, though, the right was crossing its fingers and pleading, as it did during the previous week’s Planned Parenthood attack: Please let it be a transgender leftist activist—anybody but a white, pro-life, Christian male whom we’ll have to fit into our “mentally deranged and apolitical” narrative. But when the names of the shooters Syed Farook and his wife, Tashfeen Malik, surfaced, you could almost hear the right’s whoops of, if not ecstasy, then of sweet revenge. 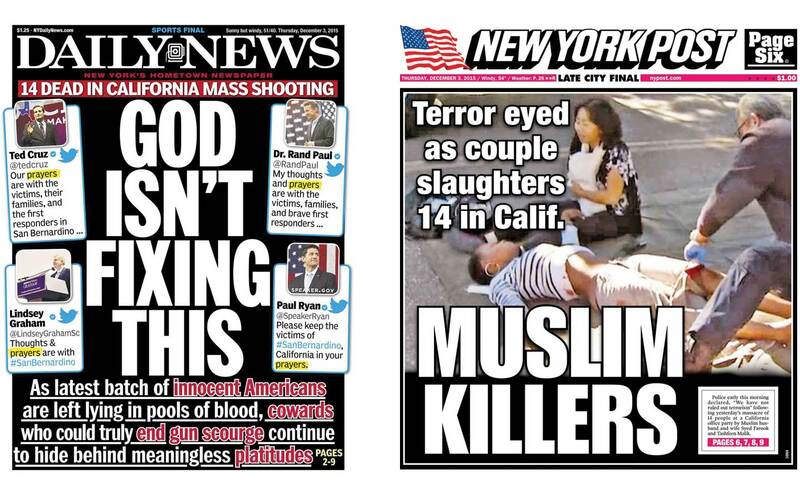 The New York Post changed its cover headline from the cautious murder mission to the incendiary muslim killers. (Where was the Post headline christian killer for suspected Planned Parenthood attacker and self-described Christian Robert L. Dear Jr.?) Fox News anchors kept saying that Farook attacked his co-workers at a “Christmas party,” although most legit news sources described it as a “holiday party”—which is indeed what a government agency would call it. But Fox had found a seasonal twofer: Muslim terrorists (and their liberal symps) are leading the War on Christmas! What we have in these mass shootings, time and again, is each side accusing the other for prematurely pointing fingers. Yes, I am saying “both sides” do this, but it’s not a false balance to point out that both sides are desperate to avoid blame. Beyond that, though, there is an enormous imbalance in how any politically inflected mass shooting is played out in the media. The right gets more fear mileage out of these tragedies, in part because it feeds on media that reflexively individualize the white male, while presenting Muslims, or Latinos or blacks, as undifferentiated hordes. The right’s savvy use of fear and stereotypes is right now fueling actual policy: blocking immigration reform and progress on bringing refugees to America. The left, meanwhile, is seeing reproductive rights chipped away at and gun control measures, at best, frozen. And most mainstream news media don’t bother to remind the public that since September 11, 2001, more Americans have been killed “by white supremacists, antigovernment fanatics and other non-Muslim extremists than by radical Muslims.” San Bernardino is the 355th mass killing this year, and the vast majority don’t involve Muslims at all. Some media are trying to transcend the Christian vs. Muslim fixation by focusing on the common denominator in all mass shootings: guns. The real politics of San Bernardino will boil down to something simpler: boosting Donald Trump. A CNN poll, taken before the massacre, just put him 20 points ahead of his closest opponent, Ted Cruz. Right before San Bernardino, the Republican front-runner declared that he would “take out” the families of terrorists. In the two days since, he’s been tweeting about more mundane matters, like his book (“crippled america is perfect gift for friends & family”), his perfect health and “great genes,” and his “vindication” after finding a couple 2001 reports referring to some Muslims here and there in New Jersey who celebrated 9/11—though Trump is still far short of the “thousands” he insists he saw on TV with his own eyes.